Do you use Google+ as a part of your marketing strategy? If so, are you familiar or do you know how to use Google +Post Ads? Earlier in 2014, Google launched +Post Ads. This feature enables brands with at least 1,000 followers to advertise their Google+ content through the Google Display Network. Google launched this feature to encourage brands to advertise their content instead of trying to sell their product to their target audience. +Post Ads allow brands to advertise any type of content. Whether it’s a video, simple Plus post, or even a Google Hangout, Google+ users can advertise their content and receive engagement from their audience. The coolest part about this feature is that Google+ Post Ads are advertised virtually on any website across the Internet. 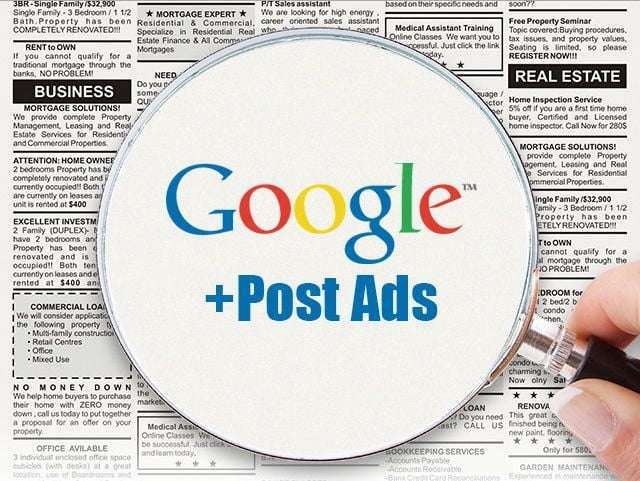 Why should brands use Google +Post Ads? Since Google+ Post Ads are advertised through the Google Display Network, brands can drive engagement from multiple sources across the Internet. This increases your content reach and creates more opportunities for engagement. Additionally, brands who published +Post Ads experience 50 percent more engagement than traditional advertising tactics. When you use Google+ Post Ads, you’re paying Google to advertise your Google+ content. Instead of paying for social advertisements that don’t get noticed by your target audience, Google+ Post Ads are designed with your audience in mind. Not only that, but you’ll also be able to control where your +Post ads are published and who views your ads. As an added bonus, any person who’s logged into Google+ will be able to comment, share, and +1 your +Post Ads. When creating +Post Ads, it’s important to make them engaging and visually appealing. Since +Post Ads promote your Google+ content, you want to use strong call to actions, visuals, and take advantage of the Google+ Post formatting to make your content stand out. It’s also important to keep in mind that your +Post content should be relevant to your audience. Interested in creating a +Post Ad? Here are the steps you should follow when creating a +Post Ad. The first step to creating a +Post Ad campaign is to create an Adwords campaign within the Google Display Network. You’ll select the type of engagement you want to create and set you devices, budget, and language. Google +Post Ads can also be added to a current Adwords campaign, but you’ll have to make sure they’re selected as engagement ad campaigns. Next, you’ll create an Ad Group for your +Post Ad campaign. You’ll select your targeting settings and choose your default button. Afterwards, you’ll be prompted to create the advertisement that’ll be used during your +Post Ad campaign. Under “Choose a template”, you’ll select the +Post Ad template. This enables you to create a +Post Ad targeted towards your audience. During this step, you’ll also be asked to select a previous Plus post and URL you want to promote. Once you’ve created your +Post Ad campaign, you’ll be ready to respond to engagement! Remember, anyone who is logged into their Google+ accounts will be able to comment, share, or +1 your content. As your campaign continues, make sure you engage with your customers and respond to their comments and questions. +Post Ads are a great way to build a community for your brand and create loyal followers. By following these tips, you’ll create +Post Ads that boost awareness of your brand and turn more visitors into customers. Do you use Google +Post Ads? What are your best tips for creating engaging +Post content? Ivan Serrano is a social media and business journalist living in the Bay Area of California.